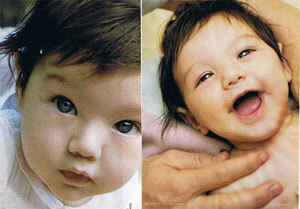 Where did Suri Cruise get her'Asian'features from? Now that the world has finally got a look at what Tom Cruise and fiance Katie Holmes'baby daughter Suri looks like, people have been left wondering whether either of her parents have an Asian ancestor. According to TMZ.com, website Jossip cheekily wonders whether or not Suri's delicate, almond-shaped eyes, the milky, pale-ish skin tone, the striking mane of dark, dark hair will lead to an article in Vanity Fair magazine as to why the tiny tot"has Lucy Liu's eyes"in "six years". And website Gawker posted an Asiatic-looking parody shot of the baby--something that quickly spread around the Internet and prompted a disclaimer. Baby Suri was born on April 18 this year, but neither she nor her pictures were seen by the public, except for a select few, for the first four and a half months of her life, prompting some to wonder whether or not she actually existed. The first pictures of Cruise and Holmes'baby's are available in Vanity Fair magazine's new issue that not only has the three on its cover page, but also has a full 22-page album of the happy family that shows the baby and her parents playing and having fun with each other.